According to Deirdre, the artist who makes this beautiful creation, this necklace is created in pewter and hangs on a 18" steel ball chain. A sweet potato pearl hangs from the top. 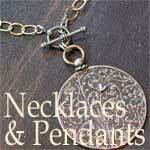 The pendant measures 1" x 1/2". For a little extra cost you can customize this piece with handstamping on the back, up to 9 characters. If you would like to add the personalization, please select the correct number from the box below and add your text in the box. 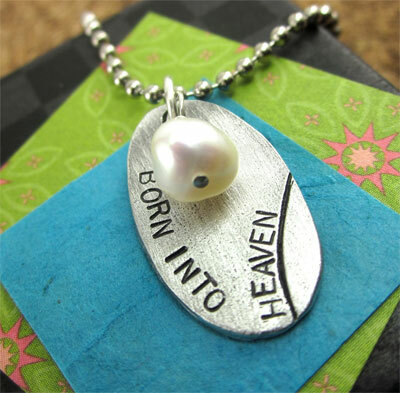 Perfect memorial gift to comemorate the loss of a loved one. From A Little Faith Sterling Jewelry.